The Celts were ancient Europeans who had their glory days roughly from 700 - 100 BC. 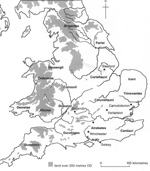 The term Celt, which you can also spell Kelt, stems from the Latin word Celta. One Celta, two Celtae. 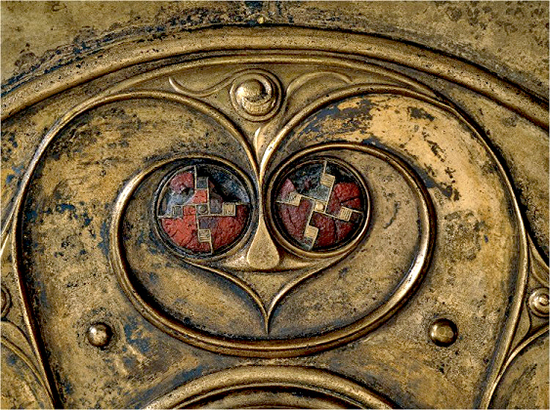 Celtic design on the Battersea Shield. Length: 77 cm or 30 in. Iron Age, 350-50 BC. Found in the River Thames at Battersea Bridge, London, England. Scroll down for a photograph of the entire shield. 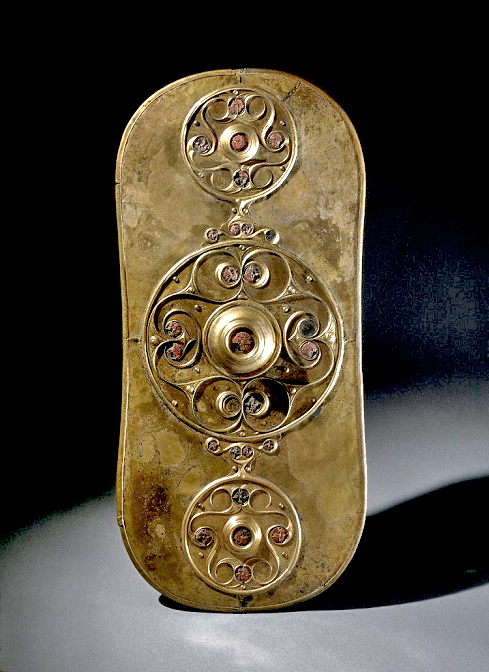 From central Europe, the Celts migrated into all directions. Herodotus, who lived 484-425 BC, spelled the Celts Keltoi. But for the Greeks, the term Keltoi generally referred to all northern foreigners. 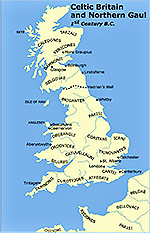 Often all Iron Age people are called ‘Celts’, but in fact many different sorts of people lived in different parts of Britain and Europe at this time. All these differ from each other in language, customs and laws. The river Garonne separates the Gauls from the Aquitani; the Marne and the Seine separate them from the Belgae. Of all these, the Belgae are the bravest, because they are furthest from the civilization and refinement of [our] Province, and merchants least frequently resort to them, and import those things which tend to effeminate the mind; and they are the nearest to the Germans, who dwell beyond the Rhine, with whom they are continually waging war; for which reason the Helvetii also surpass the rest of the Gauls in valor, as they contend with the Germans in almost daily battles, when they either repel them from their own territories, or themselves wage war on their frontiers. 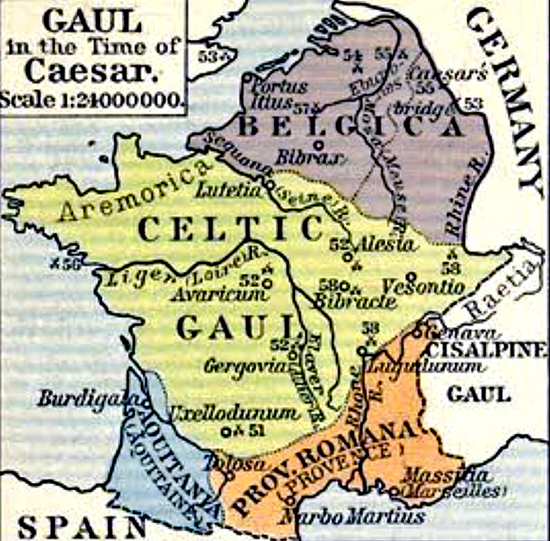 One part of these, which it has been said that the Gauls occupy, takes its beginning at the river Rhone; it is bounded by the river Garonne, the ocean, and the territories of the Belgae; it borders, too, on the side of the Sequani and the Helvetii, upon the river Rhine, and stretches toward the north. The Belgae rises from the extreme frontier of Gaul, extend to the lower part of the river Rhine; and look toward the north and the rising sun. Aquitania extends from the river Garonne to the Pyrenaean mountains and to that part of the ocean which is near Spain: it looks between the setting of the sun, and the north star. The Celts, or Gauls, sacked Milan in 396 BC and Rome in 390 BC and only left after having received a truckload of money from the locals in order to leave them alone. 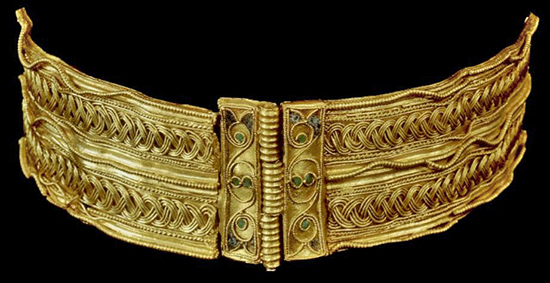 These and other absolutely amazing Celtic designs can be explored at the British Museum, London. And here is more on the Stone Age / Bronze Age / Iron Age.